Favorites of fans and critics alike, Little Brother, the North Carolina duo of Phonte and Rapper Big Pooh, is proud to finally confirm the release of an album people have been waiting on for years. LeftBack, which will be the fourth album of Little Brother’s illustrious career, will be available April 20th via Hall Of Justus. The duo worked through several versions of the album before locking in the final version of LeftBack. Close followers of Little Brother may already be familiar with the LeftBack title, however, any previously held notions of this album being an EP should be dismissed. Little Brother opted to scrap the EP concept and instead, crafted an album's worth of material for those who have been waiting patiently for new content. "I didn't want our last record to be a bunch of second-rate material," says Phonte. "I wanted to walk away from Little Brother knowing that I gave our fans all that I had to give, and said everything I wanted to say. With LeftBack, I've done that." 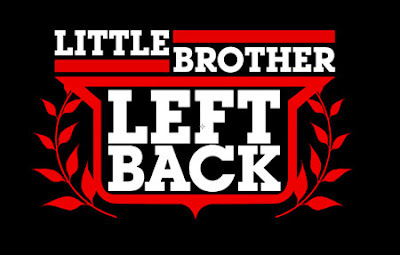 Continuing the tradition they set with the critically acclaimed GetBack, Big Pooh and Phonte have enlisted multiple producers for LeftBack, both from within and outside of the Justus League camp. Producers for this album include frequent collaborator Khrysis and GetBack producers Denaun Porter and Zo!, as well as efforts from Symbolyc One and first time Little Brother contributors, J. Bizness, and King Karnov. In addition to production, Khyrsis will also be contributing guest vocals on the album. Joining the North Carolina producer/MC are Torae, Truck North, Jozeemo and fellow Justus League MC's Chaundon and Median. Resident crooner Darien Brockington and songstress Yahzarah also supply vocals on the album. Despite Little Brother's dominating presence in the hip-hop world since the 2003 release of The Listening, LeftBack will mark the duo's first album with a true multi-media experience. Accompanying LeftBack will be four official music videos, all shot and directed by Matt Koza, known for his previous work with Foreign Exchange, Rapper Big Pooh, Kam Moye, RJD2, and more. While not customary for a Little Brother release – the group has had only one previous official video, for The Minstrel Show's "Lovin' It" – with LeftBack, Little Brother is excited to offer loyal supporters a long-desired visual take on the group's music. Says Big Pooh, "Three albums, three mixtapes, one video. It doesn't make a whole lot of sense in this day and age. We have always lacked in the visual department, and I think it will be refreshing to finally offer the people those visuals." Building on the album's multi-media offerings, the initial pressing of LeftBack will also feature a limited edition DVD full of exclusive bonus material. Compiled in a documentary format, the bonus DVD will include recent tour footage, as well as exclusive Little Brother footage shot and archived throughout their career. For fans that miss the initial run, a subsequent DVD-only release will also include all official music videos from LeftBack.